Barcelona is a city known for great food. Unfortunately for vegetarians, the food it’s known for is mostly meat and seafood. Sure, a handful of tapas are vegetarian, but there are very few actual fresh vegetables on the menus of most restaurants. During my visit I made sure to seek out a few vegetarian-friendly restaurants, and had some really good meals. Above you see the “scallops” of seitan from Amaltea. 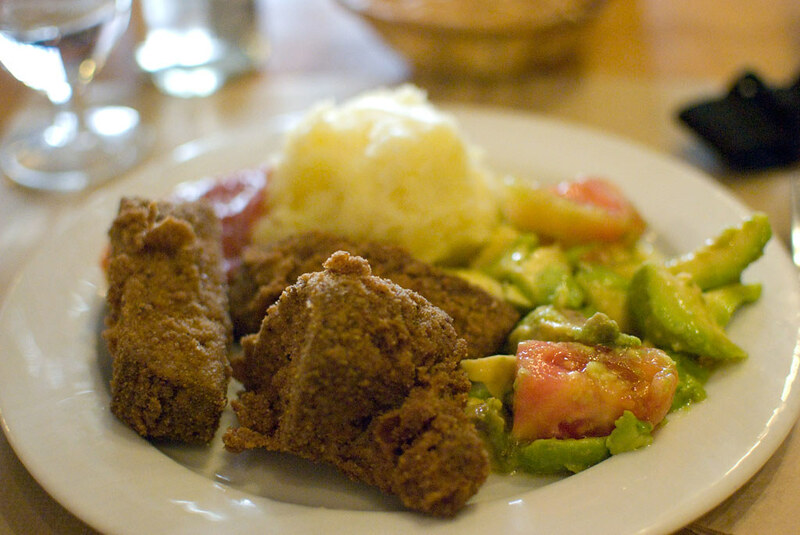 Big chunks of seitan were breaded and cooked until crispy. I say “cooked” because I’m not sure how they were prepared — I would say fried but they weren’t greasy. I would say baked but they weren’t dry. These seitan scallops, however they were cooked, were delicious. Here they were served with a fresh avocado and tomato salad and a mound of what may have been the best mashed potatoes I’ve ever had. The fixed price lunch also included an appetizer, in my case a hearty, pureed carrot soup. 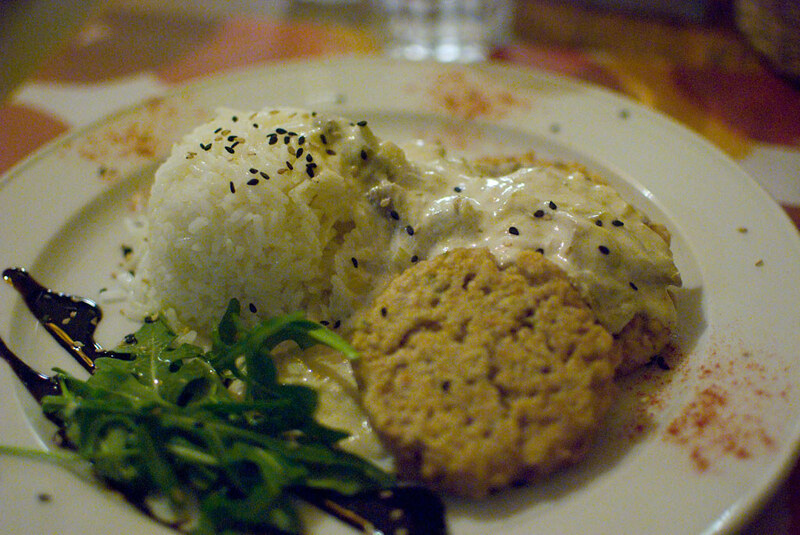 The first really good meal I had in Barcelona was at Cafe Bliss. I found the restaurant while looking for a different restaurant, and didn’t notice until later that Cafe Bliss was actually listed in my guidebook. I ended up spending almost two hours relaxing in Cafe Bliss, and ate quite well. I started with a pureed vegetable soup, and eventually moved on to the soy burgers pictured above. Served with a mushroom sauce with a scoop of rice and some arugula and a balsamic reduction, this was comforting and rich in a way I wasn’t expecting. I ended my meal with a slice of cheesecake — the cheese itself only barely sweet, but topped with a thin layer of sweet, fresh blackberry jam. I highly recommend Cafe Bliss as a place to relax after a long day of sightseeing. At Biocenter I was made to feel extremely welcome. When my Spanish began to falter the server took his time to explain the fixed price menu. A meal at Biocenter starts with the salad bar. I know that may not sound like much, but it had been a few days since I had some good fresh veggies. You can also get a bowl of soup, though I decided not to have one. 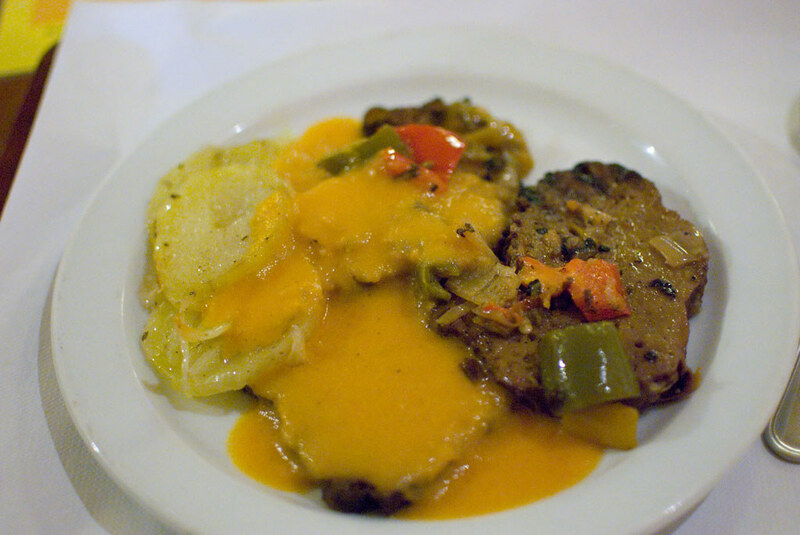 For your main course you can choose from a menu of about six or seven vegetarian options. I got the seitan chimichurri, pictured above. Not the best thing I ate during my trip, but certainly good and filling. I ended my meal with a kind of cinnamon pudding, topped with a generous dollop of unsweetened whipped cream. The meal I had at La Báscula was one of the best meals I had in Barcelona. Sometimes you know you have a great sandwich as soon as you pick it up. The warm, crusty whole wheat baguette let me know that this was one of those great sandwiches. 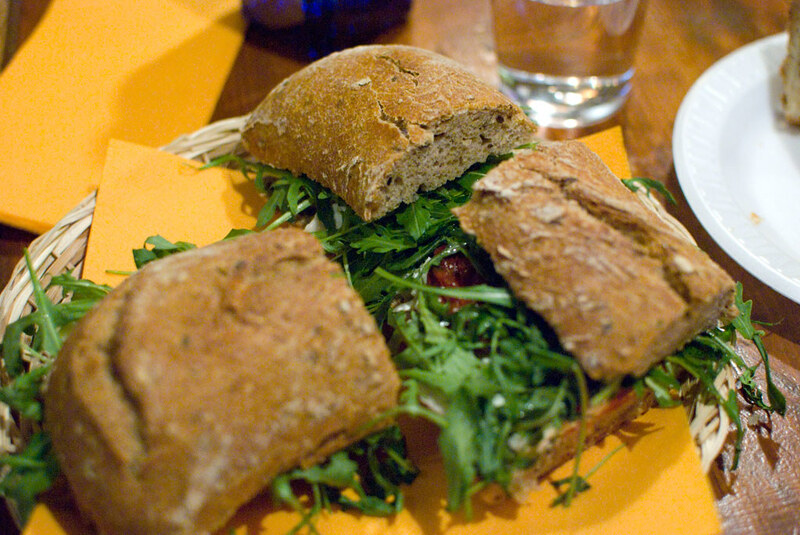 Full of creamy brie, chewy sun-dried tomatoes, and arugula, I was loving it. The cashier came over a few minutes after I started eating to apologize; they had accidentally left the seitan off of my sandwich. At this point I was too in love with the sandwich to give it up, though. I also had an excellent slice of apple cake studded with raisins and cinnamon. In an interesting note, I was speaking to a Barcelona resident after I returned, and when he found out I was a vegetarian he asked if I had eaten at La Báscula. When the natives recommend it, you know it’s good. I had planned on eating at Sésamo, another vegetarian restaurant, but their hours were very limited and I wasn’t able to make it there. If anyone has been, let me know how it was. More Barcelona posts will be forthcoming: the markets of Barcelona, my experiences with tapas, and a meal the cutting edge Comerç 24.